Regional definitions vary from source to source. The states shown in dark red are always included, while the striped states are usually considered part of the same region called the Mountain States. 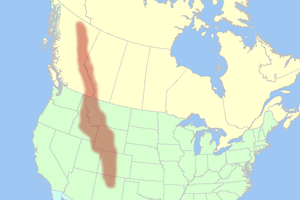 Map of the Rocky Mountains of western North America. The Mountain States (also known as the Mountain West and the Interior West) form one of the nine geographic divisions of the United States that are officially recognized by the United States Census Bureau. It is a subregion of the Western United States. The Mountain States generally are considered to include: Arizona, Colorado, Idaho, Montana, Nevada, New Mexico, Utah, and Wyoming. The words "Mountain States" generally refer to the US States which encompass the US Rocky Mountains. These are oriented north-south through portions of the states of Montana, Idaho, Wyoming, Colorado, Utah, and New Mexico. Arizona and Nevada, as well as other parts of Utah and New Mexico, have other smaller mountain ranges and scattered mountains located in them as well. Sometimes, the Trans-Pecos area of West Texas is considered part of the region. The land area of the eight states together is some 855,767 square miles (2,216,426 square kilometers). 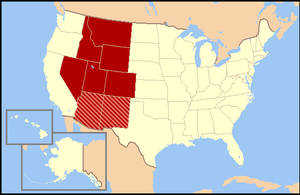 Together with the Pacific States of Alaska, California, Hawaii, Oregon, and Washington, the Mountain States constitute the broader region of the West, one of the four regions the United States Census Bureau formally recognizes (the Northeast, South, and Midwest being the other three). The terrain of the Mountain West is more diverse than any other region in the United States. Its physical geography ranges from some of the highest mountain peaks in the continental United States, to large desert lands, and rolling plains in the eastern portion of the region. The Mountain West states contain all of the major deserts found in North America. The Great Basin Desert is located in almost all of Nevada, western Utah, and southern Idaho. Portions of the Mojave Desert are located in California, but over half of the desert is located in southern Nevada, in the Mountain West. Meanwhile, the Sonoran Desert is located in much of Arizona, and the Chihuahuan Desert is located in most of southwestern and southern New Mexico, including White Sands and Jornada del Muerto. Colorado also has scattered desert lands in the southern and northwestern portions of the state, including the expansive San Luis Valley. The climate of the Mountain West is one of the more diverse climates in the United States. The entire region generally features a semi-arid to arid climate, with some alpine climates in the mountains of each state. Some parts of the tall mountains can receive very large amounts of snow and rain, while other parts of the region receive very little rain, and virtually no snow at all. The High Plains in the eastern portion of the region receive moderate snowfalls, but very little rain. The states of Nevada and Arizona are generally filled with desert lands and scattered mountain ranges. Much of Nevada receives little to no snow in the southern portion of the state, while northern Nevada can receive large amounts of snow in and around the mountains, and even in the desert lands in Nevada. Arizona generally receives little rain or snow, but high elevations in and near mountains receive extremely large amounts of rain and snow. Northern and northeastern Arizona display characteristics of a "High Desert", where the summers are very hot and dry, while the winters can become very cold, and it can snow as well. Utah is also generally large desert lands, with mountains as well. However, the desert lands in Utah receive significant snowfall, and there are large amounts of snowfall on and around the mountains. Colorado and New Mexico have very similar climates. Both states can receive significant snowfalls off the mountains, while the mountains in both states receive extremely large amounts of snow. However, southern and southwestern New Mexico generally does not receive much snow at all, similar to southern Nevada and southern Arizona. The desert lands found in northeastern Arizona, eastern Utah, northern New Mexico, and western and southern Colorado are generally referred to as the "High Desert" lands. The eight Mountain States have the highest mean elevations of all 50 U.S. states. Mount Elbert in the Sawatch Range of Colorado is the highest peak of the Rocky Mountains and the Mountain States. 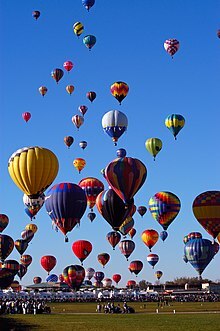 The Phoenix metropolitan area is the most populous metropolitan area of the Mountain States, followed by Denver, Las Vegas, and Salt Lake City. Phoenix is also the most populous city. The following table is a ranking of Rocky Mountain cities by city population. Hanging Lake near Glenwood Springs, Colorado. Borah Peak is the highest point in the state of Idaho. The Absaroka Range of Montana. The Taos Pueblo of New Mexico. ^ ""Chapter 9 - THE MOUNTAIN WEST AND SOUTHWEST"". Geography: USA. Archived from the original on June 14, 2010. Retrieved February 25, 2011. ^ The Shifting Terrain of the Mountain West. Research.allacademic.com (May 7, 2013). Retrieved on 2013-07-17. ^ Welcome - High Plains Regional Climate Center. Hprcc.unl.edu (June 13, 2013). Retrieved on 2013-07-17. ^ Private Tutor. Infoplease.com. Retrieved on July 17, 2013. ^ North American Deserts. DesertUSA. Retrieved on July 17, 2013. ^ See the List of U.S. states by elevation. ^ "Gannett Peak Cairn". NGS data sheet. U.S. National Geodetic Survey. Retrieved October 20, 2011. ^ "Kings Peak Target". NGS data sheet. U.S. National Geodetic Survey. Retrieved October 20, 2011. ^ "Wheeler". NGS data sheet. U.S. National Geodetic Survey. Retrieved October 20, 2011. ^ "Granite Peak". NGS data sheet. U.S. National Geodetic Survey. Retrieved October 20, 2011. ^ "Annual Estimates of the Resident Population for Incorporated Places of 50,000 or More, Ranked by July 1, 2014, Population: April 1, 2010, to July 1, 2014". The American FactFinder. United States Census Bureau, Population Division. Retrieved August 14, 2015. ^ "Annual Estimates of the Resident Population: April 1, 2010, to July 1, 2014 - United States -- Metropolitan and Micropolitan Statistical Area; and for Puerto Rico". The American FactFinder. United States Census Bureau, Population Division. Retrieved August 14, 2015. ^ "Annual Estimates of the Resident Population: April 1, 2010, to July 1, 2014 - United States -- Combined Statistical Area; and for Puerto Rico". The American FactFinder. United States Census Bureau, Population Division. Retrieved August 14, 2015. ^ "OMB Bulletin No. 13-01: Revised Delineations of Metropolitan Statistical Areas, Micropolitan Statistical Areas, and Combined Statistical Areas, and Guidance on Uses of the Delineations of These Areas" (PDF). whitehouse.gov. Office of Management and Budget. February 28, 2013. Archived from the original (PDF) on April 8, 2016. Retrieved August 15, 2015. ^ Gettings, John; Brunner, Borgna (April 21, 2018). "Daylight Saving Time". InfoPlease. Wikimedia Commons has media related to Mountain states. Wikivoyage has a travel guide for Rocky Mountains (United States of America).